Perfect for any group... social, corporate, conference, weddings, bucks/hens celebrations, birthdays and educational school group charters! Spend you day, your way! Able to cater for up to 206 guests at a time! Ocean Rafting's Whitsunday tours visit the "wild side" of the Whitsunday Islands and are perfect for anyone looking to squeeze the Whitsundays into one day. The Ocean Rafting vessels are powered by 500hp engines, so you don't have to worry about wasting any time between your destinations. Our past guests agree that getting from one place to the next is half the fun! Flexible itinerary! Pick one of our suggestions or make your own! Buffet lunch with complementary soft drink, water and ice. Choose your favourite destinations in the Whitsundays and tailor your private charter to suit your group. 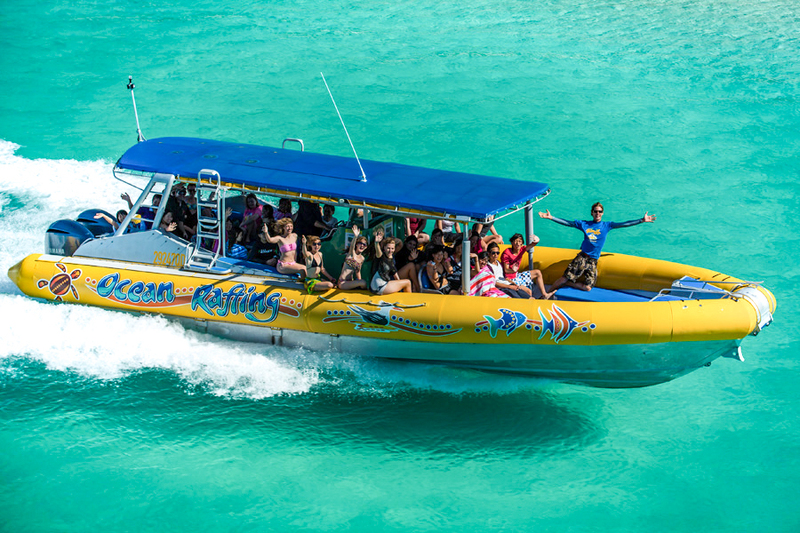 Ocean Rafting hold special permits which allow them to access Hill Inlet Beach at Whitehaven beach and snorkel in natural, protected areas within the Great Barrier Reef Marine Park. They also offer fantastic secret snorkel spots where you can snorkel the fringing reefs of the Great Barrier Reef around the Whitsunday Islands. Ocean Rafting has suggested itineraries for the day which we can recommend. Weather conditions and tides will also affect itinerary options and what can be done on any particular day. Ocean Rafting can tailor-make your day to suit your requirements such as departure times and locations. Please discuss your preferences with us! To view the sample menu for Ocean Rafting please click here. Cameras ideally in a waterproof case or Tupperware. Cancellations made less than 14 days prior to departure will result in complete forfeiture of the full ticket price. Any cancellations outside of 14 days will forfeit the deposit. If the boating company has to cancel the trip (prior to the boat's departure) and we cannot offer a suitable alternative, then a refund will be given, minus card fees. We strongly recommend that you have travel insurance especially during the wet season. Thank you for booking with Sailing Whitsundays / Mr Travel. If you need any advice or assistance making arrangements for your accommodation or transfers please do not hesitate to ask.